If you’ve ever worked a job fair, you know it can be a fast-paced, demanding experience. As with most things, the more you prepare for it, the more you will get out of it. Here are some tips to follow before, during, and after the event. Give thought to who will attend. Make sure the representatives who will be attending can speak at length about your organization’s mission and career opportunities. Their clothing or a nametag should clearly indicate they are with the company. And if they are military veterans, include that on their nametag or on a sign at the booth. We highly recommend you bring along a hiring manager to conduct one-on-one interviews at the event. We provide a semi-private room to allow for impromptu interviews to take place with selected candidates throughout the day. Take advantage of early set-up. Arrive early to give yourself time to get set-up before the doors open to job seekers. Many of our military candidates arrive early, and you want to be ready to greet them at 9:00 am sharp and hit the ground running. Include a visual display. A visual exhibit at your booth will grab the attention of job seekers and give them an idea of what your organization is about. Make sure your display highlights the benefits that your organization offers the military candidates. Bring literature to share with candidates. What should the candidates know about your organization, such as mission, training programs, career paths, health benefits? Provide a handout that gives information pertinent to a potential employee or prospective client. A handout of your organization’s open positions is a useful reference to give candidates. Also bring a stack of your business cards. Promote your presence at the event. Use your organization’s website and social media channels to get the word out to candidates that you’ll be at the job fair. When attending Corporate Gray Job Fairs, you will have early access to the resumes of candidates who have pre-registered. Search for those candidates who match your criteria on Corporate Gray Online and invite them to meet with you at the event. Be approachable. Standing in front of the table will make you appear more approachable. Job seekers often feel intimidated at these events and a friendly greeting and handshake go a long way to helping them relax and engage in a productive conversation. Keep the smart phone put away during lulls and instead engage passersby in conversation by asking, “What type of position are you seeking?” to start the ball rolling. Explain the hiring procedure to candidates. Simply directing candidates to the website is discouraged. They may need to apply via your ATS, but if so give them tips for navigating the application process. Make them feel like visiting your booth was time well spent. Collect resumes. Take resumes if you are able, and let the candidate know what the next step in the process will be for them. If you cannot accept resumes, explain to them the reason behind your organization’s policies (whether it’s due to OFCCP compliance or use of an ATS, etc.) so they won’t think you aren’t interested in them. Take notes or collect contact information. Help your memory after the event by taking notes or collecting contact information for candidates you may want to follow up on or share with other recruiters later. Conduct on-site interviews. As mentioned earlier, at Corporate Gray events you will have access to a semi-private room for conducting one-on-one conversations with candidates you deem a match for open positions. Take advantage of the opportunity to advance the hiring process for those immediate needs. Network with other recruiters. Meet and share recruiting ideas with other exhibitors at the event. Use this opportunity to grow your HR network. Stay for the full event. Although the crowd may seem to dwindle toward the end of the event, stay setup for the full duration. Seeing companies leave early is disappointing and frustrating to the candidates who made the effort to attend. You could miss out on meeting some excellent prospects if you leave early. Stay organized. Keep a record of the candidates with whom you met and store their information in your organization’s ATS or contact database. You may also want to track where you met the candidate (e.g., Corporate Gray Job Fair). Follow up. Send candidates a follow-up email or phone call to better understand how their skills and experience might match your organization’s needs. Remember that the best candidates are in high demand. Search resumes. With hundreds of candidates attending the job fair, chances are high that you didn’t meet with all of them. Use your resume search access on Corporate Gray Online after the event to search for and reach out to candidates who pre-registered and/or attended the event. This resume search access is for any recruiter in your organization, so share this information company-wide. 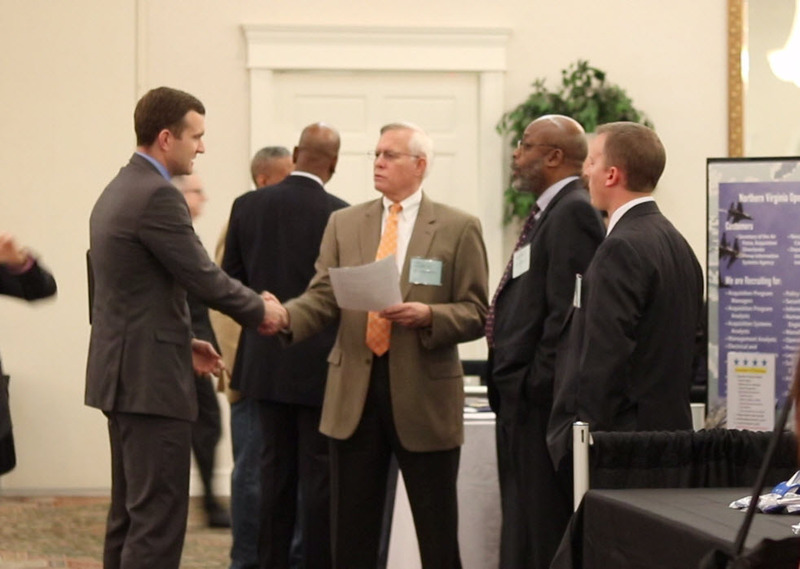 Put these tips to good use at the next Corporate Gray Military Job Fair! This entry was posted in General, Job Fairs and tagged career fair, job fair, job fair advice, job fair tips, military veterans, networking by Karin Durkee. Bookmark the permalink.